A funny thing happened on the way to the Ryman. Blues rocker and renowned guitarist Joe Bonamassa had announced via press release that a select run of dates on his summer tour would be dedicated to celebrating country music legends Johnny Cash, Willie Nelson, George Jones, and Hank Williams. But on the first night in San Diego this idea went over like a lead balloon with many fans in attendance. So, by the time day two of his impressive three-night stand in Nashville, Tennessee rolled around on August 10, 2018 Joe was back "Deep In The Blues Again". 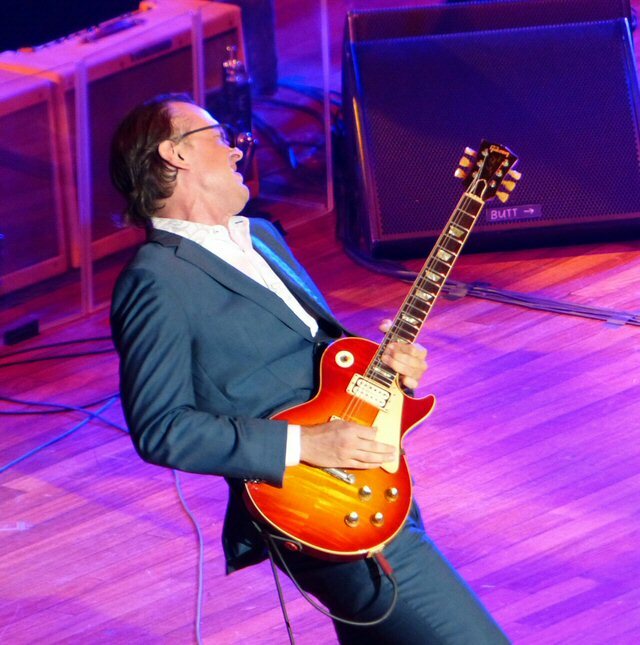 Joe Bonamassa Redeems the Blues at the Mother Church of Country Music. That song is from Bonamassa's upcoming new blues and hard rock heavy record called Redemption scheduled to drop in September. More tracks from that release "Just Cause You Can" and "Self Inflicted Wounds" were played third and fourth in the set at the Ryman and both underscored Bonamassa's current dilemma. You see, Joe through a methodical plan and constant touring has reached an amazing milestone as he has ascended to the very top of the genre he most often plies his trade in. But, he obviously has a yearning to branch out a bit beyond the blues just as his hero Eric Clapton was able to do throughout his prolific career. But, just because he can, doesn't mean he should and that applies to venturing into new musical territory without properly preparing the Bonamassa faithful for such a seismic shift. The first disappointing night on this run at Humprey's Concerts By the Bay in San Diego found Joe's team scrambling to avoid any further damage from the mostly unannounced pivot toward country music by ditching the extra guitar and pedal steel players and revising the setlist. It's always the Guitar Event of the Year when Joe comes to town. 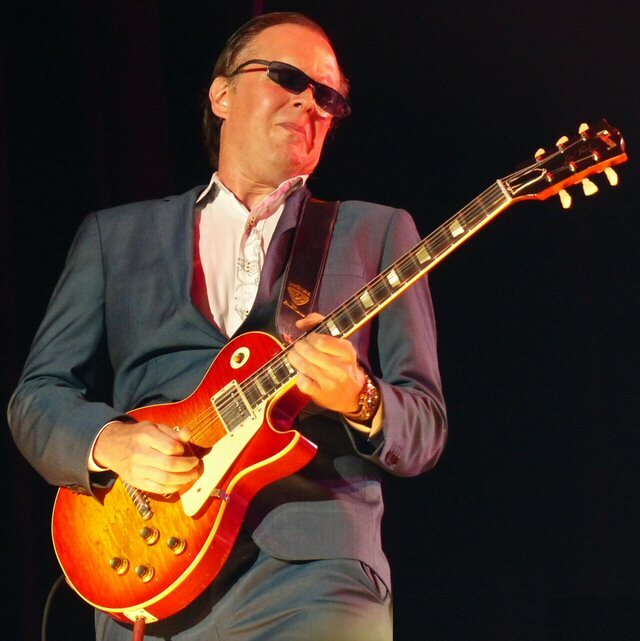 During a promotional interview with Eric Dahl of Nashville's Rock and Review Bonamassa described how playing guitar helped him to break out of a shell. As a shy kid, Joe confessed, suiting up and hitting the stage lets him become a totally new and heroic persona - one that is larger than life and wielding the six-string axe as his weapon of choice. This blues guitar hero is the character fans want to see. 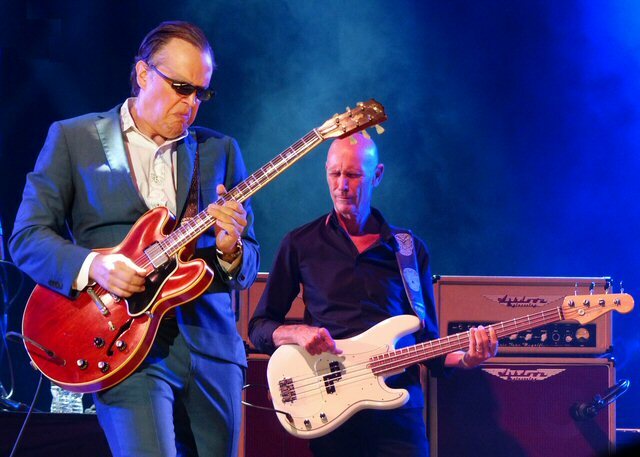 Bonamassa has spent the better part of two decades winning them over one at a time via the strength of this powerful image and his well-documented musical prowess. In the early years it wasn't uncommon to hear his name pronounced as "Bona-who". But that phrase seen on bumper stickers doesn't really apply these days as Joe has made a marquee adorning name for himself on his blues journey. Joe and his friends from the 615 - Michael Rhodes and Reese Wynans. The musician originally from upstate New York is on a journey himself that finds him now a newly minted Nashville resident with an official Tennessee driving license as he proudly and provocatively announced from the famed Ryman stage admitting that he was now "part of the problem" as a West Coast transplant. Although Joe and his talented team were in the Mother Church of Country they gave fans a set packed with blazing blues starting with a stinging "King Bee Shakedown" paired with "Evil Mama." Both allowed all band members to shine as Joe sizzled on an arsenal of axes throughout the night. The set was a good mix of new tracks from the forthcoming Redemption along with classics from Joe's ever growing catalogue. The sharply dressed blues man at the shrine of country music. 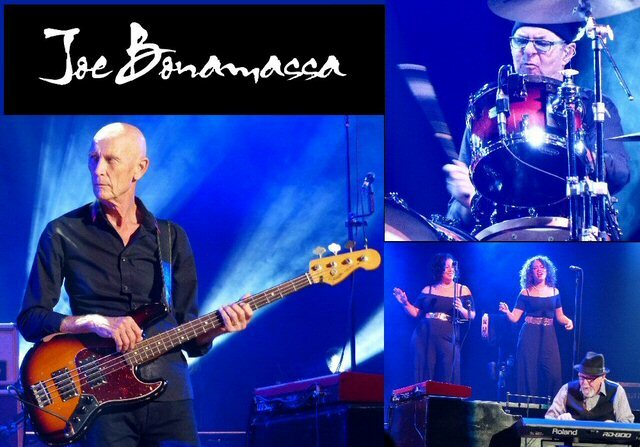 In addition to a traditional rock band configuration Joe's group included two horn players and two female vocalists/dancers who added different and dynamic elements to Bonamassa's brand of blues rock. Yet, there was even more to Joe's performance. He showed some swagger and swing on "Some Other Day" flowing into the snappy "Hidden Charms." "How Deep This River Runs" was heavy featuring a bold bass vs guitar duel that won the outfit one of many standing ovations on Friday night. After the band introductions, Joe had the ladies handle lead vocals on "Slow Train" as thunderous rhythms propelled this potent piece. "Driving Towards the Daylight" featured horns at the forefront before the drums subtly pushed the pace to the catchy and compelling hook. A feisty "Boogie with Stu" brought fans to their feet again. Folks remained standing for a lavish "Last Kiss" before they kicked it into an even higher gear with an expansive and explosive version of Led Zeppelin's "How Many More Times." The encore featured a flavorful "Sloe Gin" and a familiar cover. 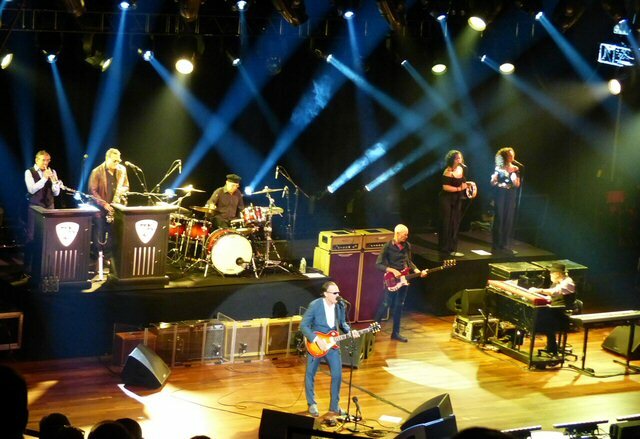 At the Ryman, Joe Bonamassa was back - deep into the blues and living up to the billed "Guitar Event of the Year." 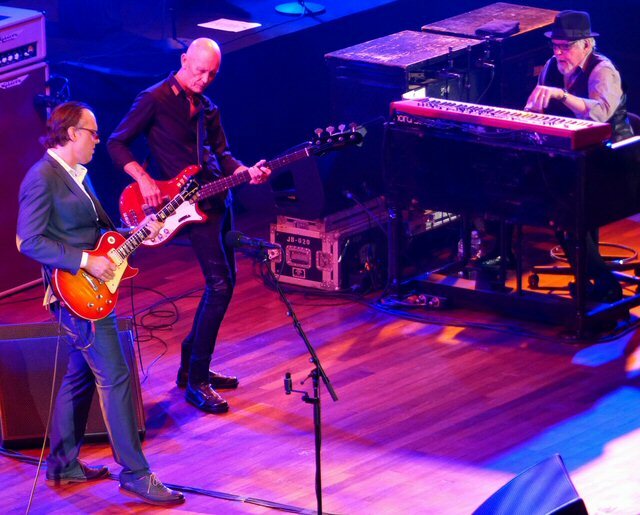 Onboard the Bonamassa train are award-winning musicians, including Australian Country Star Troy Cassar-Daly, Michael Rhodes (Academy of Country Music's 2016 Bass Player), Reese Wynans (Rock 'n Roll Hall of Fame inductee and member of Stevie Ray Vaughn's Double Trouble), Anton Fig (esteemed drummer of David Letterman's House Band) and Mahalia Barnes (celebrated Australian rock singer and daughter of Jimmy Barnes). A night of blues redemption for one and all in Music City. It's understandable that Joe might want to chart new waters and show more diversity as seen in the career of his hero Eric Clapton. The last song of the night of "Mainline Florida" was one of "god's" radio staples from 1974. All these years later Music City offers an amazing platform for a country flavored singer-songwriter and the temptation to reach that audience will probably still beckon. But, Bonamassa has now chosen some other day and time to wade into that marketplace. Until then, he's got to navigate the crowded streets of Nashville and that's enough to give anyone the blues. Nashville, Tennessee is now Bonamassa country as another world-class musician takes up residence in the 615. Joe's foray into this town's favorite genre might have been a case of premature countryfication. Still, it's probably only a matter of time before the special presentation that Joe originally planned to unveil during these August nights gets a proper spin at the Mother Church and the musical redemption comes full circle once again. The Ryman Auditorium is considered one of the best sounding rooms in the States. The hall continues to host a wide range of artists such as Joe Bonamassa. Upcoming events at the venue include Heather Land, Happy Together, Toto, Justin Townes Earl, the ACM Honors and Whitey Morgan. More legends in the hallowed hall - Michael Rhodes, Reese Wynans and Anton Fig.